Summary/Review of "How Can The Mind Occur in The Physical Universe?" "...There is this collection of ultimate scientific questions, and if you are lucky to get grabbed by one of these, that will just do you for the rest of your life. Why does the universe exist? When did it start? What’s the nature of life?... The question for me is how can the human mind occur in the physical universe. We now know that the world is governed by physics. We now understand the way biology nestles comfortably within that. The issue is how will the mind do that as well." I found out about John R. Anderson almost immediately upon discovering intelligent tutoring systems a few years ago; he and his research group at Carnegie Mellon have blazed the way forward with these technologies. Their Cognitive Tutor, for example, is currently #5 out of 39 interventions in mathematics education, as evaluated by the US Department of Education’s “What Works Clearing House”. I learned that, notwithstanding these educational pursuits, his life’s work had been more about developing a “cognitive architecture” – a model of how the structure of the mind and its components work together to achieve human cognition. I learned that he called it ACT-R (for “adaptive control of thought - rational”) and that it has been steadily undergoing refinements since it debuted in the early 70s. Anyway, given how amazed I was with his tutoring-systems research, I was naturally drawn to Anderson’s 2007 book that surveys his life’s work in attempting to answer the titular question via ACT-R.
I’m moved to blog this because I was extremely impressed by (1) the synthesis of seemingly disparate phenomena (ACT-R is very consistent with a wide range of findings in cognitive psychology), and (2) how well his theories map onto findings from neuroscience. This book contains the most convincing model of human cognition I know of, but it is spread out across several chapters and compartmentalized in such a way that I feel I can unbox everything and tie it all together here in a more readily intelligible, coarse-grained fashion. It really is amazing, but I understand if you don’t want to sit here and read a whole long synopsis. For this reason, I will now post verbatim a summary given by Anderson at the end of the book (though before he talks about consciousness), so that you can make an informed decision about whether to read further. 1. The answer [to the title question] takes the form of a cognitive architecture—that is, the specification of the structure of the brain at a level of abstraction that explains how it achieves the function of the mind. 2. For reasons of efficiency of neural computation, the human cognitive architecture takes the form of a set of largely inde- pendent modules (e.g., figure 2.2) associated with different brain regions. 3. Human identity is achieved through a declarative memory module that, moment by moment, attempts to give each person the most appropriate possible window into his or her past. 4. The various modules are coordinated by a central production system that strives to develop a set of productions that will give the most adaptive response to any state of the modules. 5. The human mind evolved out of the primate mind by achieving the ability to exercise abstract control over cognition and the ability to process complex relational patterns. "This is because the human mind is not just the sum of core competences such as memory, or categorization, or reasoning. It is about how all these pieces and other pieces work together to produce cognition. All the pieces might be adapted to the regularities in the world, but understanding their individual adaptations does not address how they are put together." Though many cognitive phenomena are certainly connectionist in nature, there is also no question that the brain is more than a uniform network of individual neurons. Much in the way that a cell is functionality partitioned into organelles, or that an organism comprises interconnected organ systems that each carry out characteristic tasks, the brain too has modularized certain functions, as evidenced by unique regions of neural anatomy associated with the performance of different tasks. The brain isn’t just one huge undifferentiated mass! Neurons that perform related computations occur close together by reason of parsimony: the further apart they are, the longer it would take for them to communicate. Thus, computation in the brain is local and parallel; different regions perform different functions in the service of cognition, though at a lower level the functionality of any given brain region is connectionist in nature. Indeed, almost all systems whose design is meant to achieve a function show this kind of hierarchical organization (Simon, 1962). If the brain devotes local regions to certain functions, this implies that we should be able to use brain-scanning procedures to find regions that reflect specific activities. The ACT-R cognitive architecture proposes 8 basic modules, and has mapped them onto specific brain regions through a series of fMRI experiments. The eight modules (four peripheral and four central), plus their associated brain regions, are as follows: (1) Visual - processing of attended information in the fusiform gyrus; (2) Aural - secondary auditory cortex; (3) Manual - hand motor/sensory region of central sulcus; (4) Vocal - face/tongue motor/sensory region of central sulcus; (5) Imaginal - mental/spatial representation area in posterior parietal cortex; (6) Declarative - memory storage/retrieval operations in prefrontal cortical areas; (7) Goal - cognition directed by anterior cingulate cortex; and (8) Procedural - integration, selection of cognition actions through the basal ganglia. A single fMRI study (Anderson et al., 2007) demonstrated the exercise of all of these modules and their associated brain regions. For our purposes, two of these modules are worth considering in more detail. While the many regions of the brain do their own separate processing, they must act in a coordinated manner to achieve cognition. Thus, many regions of localized functionality are interconnected by tracts of neural fibers; particularly important are the connections between the cortex (the outermost region of the brain) and subcortical structures. One subcortical area in particular, the basal ganglia, is innervated by most of the cortex and plays a major role in controlling behavior through its actions on the thalamus. It marks a point of convergence across brain regions, compressing widely distributed information into what is effectively a single decision point. Thus, the basal ganglia is believed to be the main brain structure involved in action selection, or choosing which of many possible behaviors to perform in a given instance. Like their associated brain regions, the ACT-R modules must be able to communicate among each other, and they do so by placing information in small-capacity buffers associated with each of them. The procedural module plays the role of the basal ganglia by responding to patterns of information in these buffers and producing action. Though all modules are capable of independent parallel processing, they have to communicate via the procedural module, which can only execute a single rule/action at a time, thus forming a serial “central bottleneck” in overall processing. So the basal ganglia plays the role of a “coordinating module”. Appropriately, this region is evolutionarily older than the cortex and it occurs to some extent in all vertebrates. The other module I wanted to consider is the Goal module, which enables means-ends analysis. This is a task that is more uniquely human; it requires that one be able to disengage from what one wants (the goal, or “end”) in order to focus on something else (the “means”). Some researchers (Papineau, 2001) assert that this is a uniquely human capability. So, where are we at? The human mind is thought to be partitioned into specific information-processing functions, and thankfully neuroanatomy appears to be cut along similar joints, with specific brain regions devoted to different functions and interconnections that provide for coordination among these functions. Having positive a cognitive architecture based on interacting modules, Anderson turns next to the nitty-gritty of learning and memory. He assumes the well-documented distinction between declarative learning, or learning of “facts” and procedural learning (skill acquisition). He doesn’t, however, make Tulving’s (1972) episodic/declarative distinction; instead he considers both explicitly learned in a given context, with the difference being that the “declarative” memory (such as “Lincoln was a U.S. president”) has been encountered in so many subsequent contexts that we no longer have access to the context in which it was originally learned. Declarative memories can be strengthened, or made more available, by mere exposure. In addition to the formation and strengthening of declarative memories, there is also procedural learning and subsequent conditioning of these actions. An example he gives is typing: we all know how to type, but we would have a difficult time if asked to give the location of a certain key on a keyboard (without using our fingers as an aid or relying on a common mnemonic like “the home row” or “qwerty”). Conditioning is how all animals learn that certain actions are more effective in certain situations through experience; these can be procedural actions or innate tendencies. Procedural knowledge is associated with the basal ganglia and will be discussed in greater detail below; for now, we will stay with declarative learning. Interestingly, there are two ways of acquiring declarative memories. This can be illustrated by anterograde amnesiacs like H.M., who, despite the loss of the hippocampus (and the ability thereby to form new memories), was able to learn about famous people such as John F. Kennedy and others who became famous after his surgery. Recent researchers have postulated two different learning systems: while the hippocampus is known to subserve most declarative learning, other brain structures can slowly acquire such memories through repetition (presumably how H.M. came to know about famous people). Furthermore, through rehearsal, memories can be slowly transferred from the hippocampus to neocortical regions, explaining why those with a damaged or missing hippocampus can still access older memories (which are presumed to have undergone such transfer). So, while the hippocampus limits the capacity of declarative memory, it does not limit all learning. I’ve long been confused about the relative finitude of memory, but Anderson makes a strong case for there being definite limits on the size of declarative memory. Beyond physical limits of sheer size and metabolic costs, he makes the interesting claim that the very flexibility of our memory-search ability derives from it being strategically limited, “throwing out” memories that are unlikely to be needed: “declarative memory, faced with limited capacity, is in effect constantly discarding memories that have outlived their usefulness”. Where tk is the time since the kth practice of an item. Thus, the past history of memory use predicts the odds that the memory will be needed. But the context of the current situation is involved as well. It turns out that memory availability is adjusted as a function of context; e.g., you will have an easier time remembering, say, your locker combination in the locker room than you would if someone were to randomly ask you for it elsewhere (Schooler and Anderson, 1997). Thus, human memory reflects the statistics of the environment and performs a triage on memories, devoting its limited resources to those that are most likely to be needed. How is this fact realized in ACT-R? In ACT-R, the “past” that is available in the form of memories consists of the information that existed in the buffers of various modules. At any given moment, countless things are impinging on the human sensorium, of which we only remember a very small fraction. For instance, ambient sounds or things in the visual periphery certainly undergo processing in various brain regions, but they seldom attended to and thus often never make it into buffers. The system is “aware” only of the chunks information in the various buffers, and these chunks get stored in declarative memory. These chunks have activation values that govern the speed and success of their retrieval. Specifically, a given memory has an inherent, base-level activation, plus its strength of association to elements in the present context. Where_ prior(i)_ is the base-level activation, or the prior odds that memory i would be needed based on factors such as recency/frequency of use, likelihood(j|i) is the likelihood ratio that element j would be part of the context given that memory i is needed (reflecting strength of association to the current context), and_ posterior(i|C)_ is the updated odds that memory i will be needed in contex C.
I’ll give the basic ACT-R memory equations without going into them much further. The main point is that memory is responding to two statistical effects in the environment: (1) the more often a memory is retrieved, the more likely it is to be retrieved in the future. This produces a practice effect and is reflected in ACT-R’s base-level activation. Secondly, (2) the more memories associated with a particular element, the worse a predictor the element is of any particular memory. This is reflected in the strengths of association in ACT-R, and produces the “fan” effect. The “fan” refers to the number of connections to a given element; increasing the sheer number of connections will decrease the strength of association between the element and any one of its connections. This is because when an element is associated with more memories, its appearance becomes a poorer predictor of any specific fact. From the perspective of the task facing declarative memory—making most available those facts that are most likely to be useful—these results make perfect sense. The already known facts have been used many times in the past, and at delay of two weeks they are likely the ones needed, so the base-level activation works to make them most active. On the other hand, the more things one knows about an individual, the less likely any one fact will be, so they cannot be all made as active. 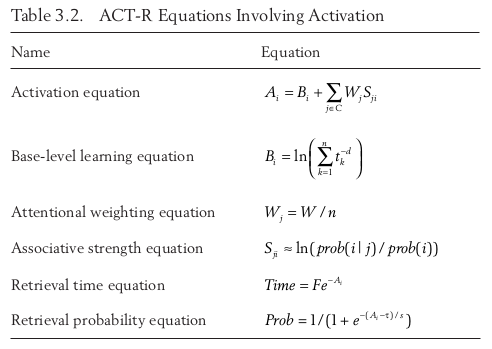 The activation equations in table 3.2 capture these relationships. This relationship is also borne out in fMRI research. The greater the activation of a memory, the less time/effort it will take to retrieve it; thus, higher activation should map onto weaker fMRI response. Using a fan-effect paradigm, it was found that greater fan (more connections to a single memory) resulted in decreased activation and therefore stronger fMRI respones (Sohn 2003, 2005). Anderson goes on in this chapter to discuss how we often choose actions and make decisions based on our memories of similar past actions/decisions and the outcomes that they produced. Here, we rely on memories rather than reasoning on the basis of general principles. Sometimes we have general principles to reason from, while other times it’s far easier to recall and act. This kind of instance-based reasoning may be far more common than has been traditionally thought. Given all of the above, we know how important a flexible declarative memory is to our ability to adapt to a changing environment; but once the relevant information has been retrieved, we have to act on it, using it to make inferences or predictions. This often requires intensive, deliberative processing which is not appropriate when we have to act rapidly in stressful situations. Indeed, to the extent that one can anticipate how knowledge will be used, it makes sense to prepackage the application of that knowledge in a way that can be executed without planning. It turns out that there is a process by which frequently useful computations are identified and cached as cognitive reactions that can be elicited directly by the situation, bypassing laborious deliberation. Thus, a balance must be struck between immediate reaction and deliberative reflection, a sort of dual processing reminiscent of Kahneman’s “Thinking Fast and Slow.” This is the way Anderson conceptualizes learning: a process of moving from intentional thinking and remembering (hippocampal/cortical) to more automatic reactions (basal ganglia). Anderson argues that 3 brain systems are especially relevant in achieving a balance between thought and action: the basal ganglia are responsible for the acquisition and application of “procedures”, or Hull’s automatic reactions; the hippocampal and prefrontal regions are responsible for storage and retrieval of declarative information, or Tolman’s expectancies; and the anterior cingulate cortex (ACC) for exercising control in the selection of context-appropriate behavior. Note that these respectively correspond to the procedural module, the declarative module, and the goal module. Declarative retrieval and of information during decision-making is very time and resource intensive; it would be sensible if our brains had a way of “hard-coding” frequently-used behaviors/actions so that we could respond more automatically to familiar situations. Fortunately, it appears they do just that! For example, Hikosaka et al. (1999) showed monkeys a sequence of 4x4 grids in which two cells were lit up, and the monkeys had to select them in the correct order. The monkeys practiced such sets over the course of several months, and telling differences emerged between performance during the early months and later months. Early on, the monkeys performed the same regardless of what order the grids were shown in, or of which hand they used; however, after months of practice, they had become much faster at completing the task but could not go out of order and could only use their favored hand to input the answer. Thus, it seemed that the monkeys had switched from a flexible declarative representation of the task to a classic stimulus-response representation. Hikosaka et al. examined the brains of monkeys performing the task in order to compare activity in the early vs. later months. As expected, the task activated prefrontal regions early on, but after much practice the task primarily produced activity basal ganglia structures, which are thought to display a variant of reinforcement learning. Furthermore, temporarily inactivating basal ganglia structures disrupted only the highly practiced sequences (not newly learned sequences). The basal ganglia, then, is involved in producing automatic responses to stimuli. Indeed, it seems to display a variant of reinforcement learning, where a behavior followed by a “satisfying state of affairs” will increase in frequency (Thorndike’s law of effect). The hippocampus is associated with Hebbian learning, where repeated occurrences of stimuli and response together serve to strengthen the connection (Thorndike’s law of exercise); this is merely a function of temporal contiguity and does not depend on the consequences of the behavior. The basal ganglia is involved in a dopamine-mediated process that learns to recognize favorable patterns of activity in the cortex (Houk and Wise, 1995). That is, dopamine neurons provide information to the basal ganglia about how rewarding a behavior was, if it was more rewarding than expected, etc. Importantly, an element of time-travel is involved, because the rewards strengthen the salience of reward-producing contexual patterns. In humans, the basal ganglia (specifically the striatum) has been found to respond differentially to reward and punishment, the magnitude of the reward/punishment, and the difference between expected and recieved reward/punishment (Delgado et al. 2003). This was all very refreshing to me. Classical and operant conditioning are often presented in psychology classrooms as museum curiosities or animal training procedures, when in fact they apply equally well to human learning. I wanted to share one final experimental demonstration of the difference between learning in the hippocampus versus the basal ganglia. This one involves a rat maze-learning paradigm; imagine a maze shaped like a plus sign (+); rats always enter on the same side, say the west side. Rats are trained to go to food housed in the south arm. What will rats do if they are put in the maze on the east side? Have they learned the spatial location of the food, or have they merely learned a right-turning behavior? If the former is true, they should turn down the correct arm of the maze to find the food; if they latter is true, their response will lead them down the wrong arm. Early results yielded no clear choice pattern (Restle, 1957). However, Packard and McGaugh (1996) trained all rats on the maze and then gave them injections that temporarily impaired either their hippocampus or their basal ganglia (specifically, the caudate). As you might expect, the rats with selective hippocampal impairment performed the right-turning response and ended up in the wrong arm of the maze, while rats with impediments to the basal ganglia chose the correct arm, presumably because their intact hippocampus contained the correct spatial “place-learning” representation. A convincing follow-up study by Packard (1999) produced the same pattern of results, but this time by using memory-enhancing agents applied selectively to the hippocampus or the caudate. This time, rats with hippocampal enhancements displayed behavior consistent with place-learning (they chose the correct arm), while rats with enhanced caudates relied on a right-turn response and chose the incorrect arm. "the first production makes a retrieval request for some declarative information, that information is retrieved, and the next production harvests that retrieval and acts upon it. The compiled production eliminates that retrieval step and builds a production specific to the information retrieved. This is the process by which the system moves from deliberation to action. Each time a new production of this kind is created, another little piece of deliberation is dropped out in the interest of efficient execution." However, this newly formed production requires multiple repetitions for it to acquire enough strength to be applicable in new situations. Such rules are learned slowly, consistent with the view that procedural memories are acquired gradually. This measure of strength is often called a rule’s “utility” since it is a measure of the value of the rule; when a situation arises where multiple rules apply, the rule with the highest utility is chosen; further, rewarding consequences following the use of a rule serve to increase that rule’s utility. When a new rule is first created, its utility is zero and thus it is extremely unlikely that it will “fire”. However, each time this rule is recreated its utility is increased. Anderson gives an excellent example using children’s learning of subtraction rules. In the interest of time I won’t go into it here, other than to say that it accounts for the most common bug in learning to subtract two multi-digit numbers: instead of always subtracting the bottom number from the top number, the buggy rule children often use is to subtract the bigger from the smaller, regardless of which is on top. This rule is so persistent because half of the time, it produces the correct outcome and thus the same reward as the more limiting bottom-from-top rule. ACT-R is used to model the acquisition of the correct rule, and I found it very compelling. "Learning can be conceptualized as a process of moving from thought- ful reflection (hippocampus, prefrontal cortex) to automatic reaction (basal ganglia). The module responsible for learning of this kind is the procedural module (or production system). I offer the procedural mod- ule as an explanation for behavior that embraces both Hull’s reactions and Tolman’s reflections and provides a mechanism for the postulated learning link between them. Through production compilation, thought- ful behaviors become automatized; through utility learning, behavior is modified to become adaptive. When combined with the declarative memory module discussed in chapter 3, the production system provides a mechanism by which knowledge is used to make behavior more flexible and efficient." Thus, an important part of cognition is the accumulation of production rules in long-term memory, which can then become activated by the contents of working memory, which can be composed into more complex production-rule chains when a particular problem is solved, the result of which can be cached and, if used above some some frequency threshold, will become a production rule in its own right.
" ...a third way to learn is by discovery and invention. Cultural artifacts such as algebra came into being because of such a process. Some constructivist mathematics educators advocate having children learn in the same manner (e.g., Cobb et al., 1992). In the extreme, it is a very inefficient way to learn algebra or any other cultural artifact... However, when one looks in detail at what happens in the process of learning from instruction and example, one frequently finds many minidiscoveries being made as students try to make sense of the instruction they are receiving and their experience in applying that instruction. Learning by discovery probably plays a more important role as a normal part of learning through social transmission (i.e., directions and examples) than it does as a solo means of learning." Anderson goes on to discuss how human cognition can support a uniquely human skill: learning algebra from verbal directions and examples. He uses ACT-R to model algebra learning and to help point the way toward what is special about human cognition. He ends up describing three such features in detail: the potential for abstract control of cognition, the capacity for advanced pattern matching, and the metacognitive ability to reason about cognitive states. Dynamic pattern matching and recursive representations are connected. Dynamic pattern matching is only useful in a system that has powerful, interlinked representations. Processing recursive representations can be much easier with dynamic pattern matching. The human brain is expanded over that of other primates, and it is not just a matter of more brain. There are new prefrontal and parietal regions, and in the case of some regions such as the ACC, there are new kinds of cells. While brain lateralization is also a common feature of many species, its connection with language seems unique (Halpern et al., 2005), and Marcus’s second feature is strongly motivated by considerations of language processing. So, it seems pretty clear that there have been some changes to the structure of the human brain that enable the unique functions of human cognition. In 2003, we noted that in ACT-R consciousness has an obvious mapping to the buffers that are associated with the modules. The contents of consciousness are the contents of these buffers, and conscious activity corresponds to the manipulation of the contents of these buffers by production rules. The information in the buffers is the information that is made available for general processing and is stored in declarative memory. ACT-R models can generate introspective reports by describing the contents of these buffers. In 2003 we did not think this was much of an answer and gave ACT-R low marks on this dimension. I have subsequently come to the conclusion that this is indeed what consciousness is and that running ACT-R models are conscious. They may not be conscious in the same sense as humans, but this is probably because ACT-R gives a rather incomplete picture of the buffers that are available in the human system. If we resist the temptation to believe in a hard problem of consciousness, we can appreciate how consciousness is the solution to the fundamental problem of achieving the mind in the brain. As noted in chapter 2, efficiency considerations drive the brain to try to achieve as much of its computation as possible locally in nearly encapsulated modules. However, the functionality of the mind demands communication among these modules, and to do this, some information must be made globally available. The purpose of the buffers in ACT-R is to create this global access. The contents of these buffers will create an information trail that can be reported and reflected upon. As in the last example in chapter 5, adaptive cognition sometimes requires reflection on this information trail. Thus, consciousness is the manifestation of the solution to the need for global coordination among modules. It is a trademark consequence of the architecture in figure 2.2. That being said, chapters 1–5 develop this architecture with only oblique references to consciousness. This is because the information processing associated with consciousness is already described by other terms of the theory. It still is not clear to me how invoking the concept of consciousness adds to the understanding of the human mind, but taking a coherent reading of the term consciousness, I am willing to declare ACT-R conscious.